My littles, Moose & the Bean, have been really into Eric Carle books lately. If you’re not familiar, Eric Carle is the author and artist behind many, many colorful children’s books, that are incredibly illustrated with hand-painted paper collages. My kids’ current fav is The Very Hungry Caterpillar. They love how the caterpillar goes through all the days of the week, eating up a storm. On Saturday, he chomps through tons of food, ending his feast with “one slice of watermelon!” They giggle about it every single time. 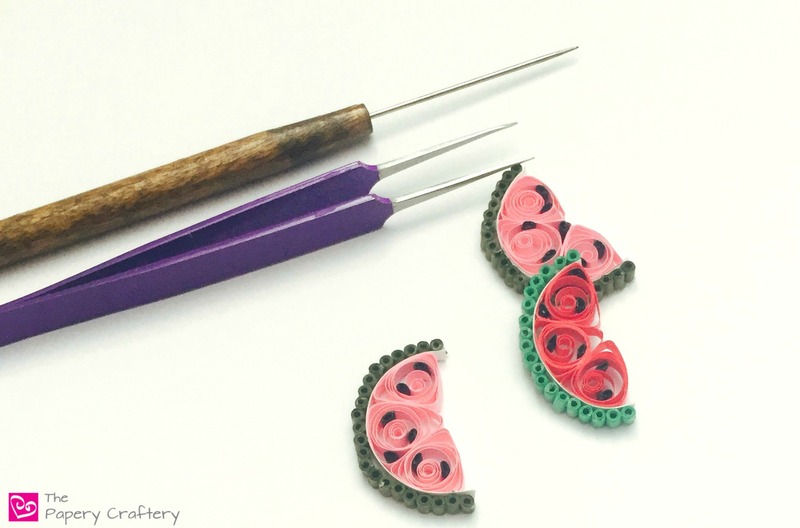 Since I’ve heard them say the word “watermelon” approximately 3987 times in the last couple weeks, of course I was inspired to create a quilling paper watermelon tutorial! In order to make these quilling paper watermelon quickly, I thought I’d reuse the template that I created for my citrus slices last summer. If you print the template as is, your finished watermelon slices will be about an inch in length. Feel free to adjust your templates when printing to make them as large as you would like. Bear in mind, all the measurements I’m including in this tutorial will be for mini watermelons. Once you’ve printed your template, gather supplies. You’ll need a quilling tool, glue, straight pins, a cork or cardboard work board, waxed paper, and the quilling paper colors of your choice. I used a bright meadow green, deep rose, white and black. Pin your printed template onto your work board with a piece of waxed paper over it. Start with the green part of the watermelon rind. Roll and glue tight coils from 1″ strips of green. I used about 19 or 20 for each of the watermelon that I made. Carefully place each coil around the rounded outside edge of the template shapes. I would recommend avoiding gluing the coils right to the waxed paper. You run the risk of ending up with a very messy underside of your fruit. I’ve also had it stick when I’ve used a poorer quality waxed paper. Try only putting a small dot of glue between each coil and pinning every other one to the board. On to the white inner rind. Fold a long strip of white quilling paper in half. Run a very thin layer of glue along on half of your paper strip and gently press the two halves together. Once dry, the white paper will be thicker and sturdier. If you haven’t invested in a needle-nosed glue bottle, I would recommend grabbing one for this craft. It will make your quilling easier and neater! When the thick white strip has dried, glue it to the inside of the green rind. Now it’s time to quill the bright pink inside of the watermelon. It’s going to be made from three equal sections, each made from a 7″ strip of pink quilling paper. Roll one of the pink strips on your quilling tool all the way to the end, but don’t remove it from the tool. Leaving the tool in the center of the coil, pull gently on the end of the strip to open up the coil. The result is a more open loose coil, but with a tight center. Place the pink coil in one of the three segments in the center of the template. Spread and pinch your coil as needed to fill the triangle segment. When you’ve gotten your coil just where you want it, apply a bit of glue between it and the white rind. Roll the other 2 pink strips the same way as the first, and pinch them to fit the remaining segments in the template. Don’t forget to glue to the rind and to each other! And a watermelon wouldn’t be a watermelon without some seeds! Roll 1″ black strips into tight coils, and pinch to make flat seeds. TIP: While you’re picking up a needle-nosed glue bottle for your quilling, grab some clear glue too! It is the way to avoid those glue bits that are always left on your darker colored quilling paper shapes. Because the pink coils were stretched a bit, there will be plenty of room to add some seeds to your watermelon. Dip each one in some clear glue and place in the curls of the pink coils. Add as many or as few as you like! I experimented with a couple different color combos and I think I really like the brighter quilling paper watermelon a little bit more. Add a few to your summer cards or scrapbooking pages. They’d fit nicely on my hexagon gift tags too! Let me know how you will use your quilling paper watermelon in the comments below! Thanks Leah! One of the goals of this site is to make quilling less scary to new crafters, so I hope you will give it a try one day. Plus, if you get frustrated when quilling, the paper you throw doesn’t do as much damage as Legos do! These are so adorable! Really cool to see the process!